What comes to mind when you think of Irish words? Maybe begorra, an alteration of "by God," or shillelagh, a blackthorn walking stick and, to some, a symbol of Irishness. And let’s not forget shamrock, which comes from the Irish seamróg, which is a diminutive of seamar or clover. But there are a whole slew of everyday words in English that have origins in Irish and Gaelic. We discussed 10 of them last year. Here are eight more common English words you might not know have Irish blood. The word biddy has multiple meanings. It seems to have originated in the early 1600s, perhaps by Shakespeare, to refer to a chicken or fowl. The OED says biddy might be an “instinctive” sound used to call chickens and is a form of the Gaelic bîdeach, meaning "very small." Starting in the 1780s, biddy was used to refer to a woman in a derogatory sense, and by the 19th century, was being used in the U.S. to mean “an Irish maid-servant." So what’s the hubbub with hubbub? The word originated in the 16th century as “the shouting of a war cry,” as well as the confused noise of a crowd. It may come from an Irish expression such as "Ub! ub! ubub!" which is an interjection expressing contempt, or the ancient Irish wary cry, "Abu!" 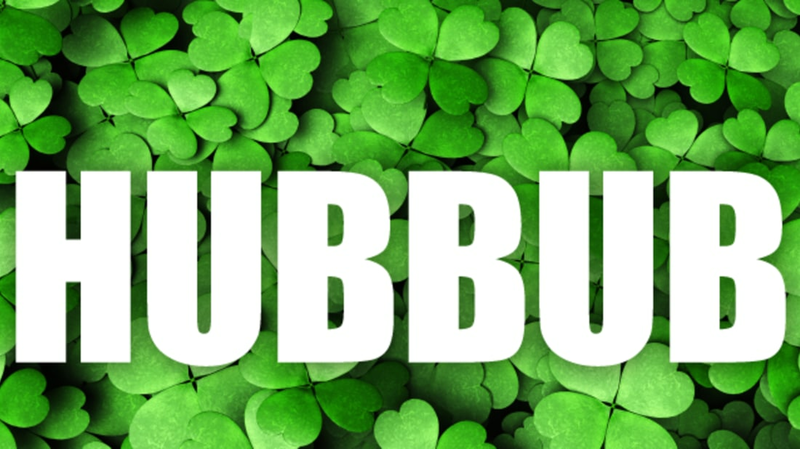 Hubbub was also the name given by colonists in 1600s New England to a Native American gambling dice game that apparently involved much shouting and, well, hubbub. The word trousers is an extension of trouse, which appeared in English in the 16th century and came from the Irish triubhas. Trouse referred specifically to a snug piece of clothing for the backside and thighs that ran down the legs and was attached to stockings.Trousers began in the 17th century as a piece of ankle-length loose cloth before evolving into the two-legged duds we know today. Another word for the ol’ kisser, puss comes from the Irish pus, meaning lip or mouth. It can also refer to a sour look or pout. You might not be surprised to know the word slob originally meant “mud” and comes from the Irish word for mud, slab. This term for a piece of wet spongy ground comes from the Irish bogach, where bog means soft or moist. Bog-trotter was a name given to the “wild Irish” of the 17th century, that is those not under English rule, and was later extended to mean anyone of Irish descent. Don Rickles can thank Irish Americans for his most famous insult. The word puck first entered English in the 1850s to mean a blow, punch, or strike, and came from the Irish poc, a term in hurling, a game similar to field hockey. By the 1880s puck came to refer to the flat disc used in ice hockey, the first indoor game of which was held in Montreal on March 3, 1875.